If you look in either direction off the Kent Narrows bridge you’ll see many dock bars, marinas, and restaurants, but you won’t see the Queen Anne’s Railroad Trestle. You won’t see it if you cruise through the Narrows by boat either. Most people will never know it’s there or what a good place to fish it is. I found the trestle a couple of years ago, but I didn’t know what it was. 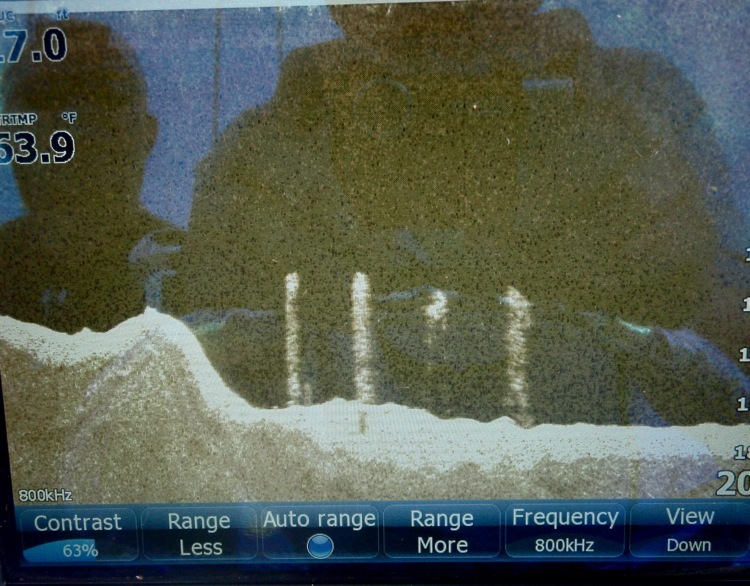 While watching my sonar screen one day I noticed a series of submerged wooden pilings. The pilings are about twelve feet below the surface and come up about six feet over an underwater ditch. When I first saw them I thought I was looking at a wreck, but it didn’t make sense that so many posts would be standing upright. My next guess was that it might be an abandoned fishing pier or maybe part of an old dock. Even though I always wondered about it, I knew it was a good fishing spot. Saturday, at the Kent Island Day festival in Historic Stevensville, I solved the mystery. Kent Island Day is a celebration of the history and heritage of the largest island on the Chesapeake Bay. Since the downtown area gets a lot of visitors, they close Main Street in front of our house. I wanted to go fishing and didn’t like the idea of dealing with barricades, so I set my alarm for 4:00 AM. Launching well before nautical twilight, my first stop was my favorite series of underwater pilings in Kent Narrows . Kent Narrows is a difficult place to fish because of strong currents, obstructions, and heavy boat traffic. The area is a haven for juvenile rockfish. Since the fish are often small, it’s usually not worth the extra effort it takes to fish there, but I’ve found that I can sneak out on bad weather days or before daylight and occasionally land a nice fish or two, especially in the more obscure fishing spots. My underwater pilings are well away from the over-fished highway bridges that connect the island with Maryland’s Eastern Shore. After my pre-dawn fishing trip I was back home and in bed by 9:00 AM Saturday morning. I woke up after dreaming about a marching band in my front yard. It turns out the festival kicks off with a parade down the street in front of our house. Since going back to sleep was out of the question, I got up and sat on the porch to watch. After the parade passed, my wife and I decided to walk downtown and join the fun. All the historic sites were open. We visited the old post office, the historic Stevensville Bank, and walked around through the vendors booths and displays. We eventually wound our way around to the city park where I noticed the little railroad museum was open. It’s always been closed before so I was anxious to look inside. On the wall was an assortment of railroad memorabilia including a collection of old newspaper articles, maps, and some historic photographs depicting scenes from the island’s early years. Near the center of the display was a yellowed newspaper article about the opening of a railroad trestle across Kent Narrows. I had solved my mystery. As I was reading the story an older gentlemen walked up and told me he remembered the trestle. I told him I liked to fish there and he said he wondered if there was fish under that bridge every time he passed over. 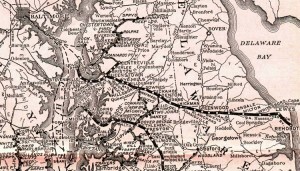 The Queen Anne’s Railroad was authorized in 1895 for the purpose of establishing a direct link between the beaches of the Atlantic Coast and Baltimore. 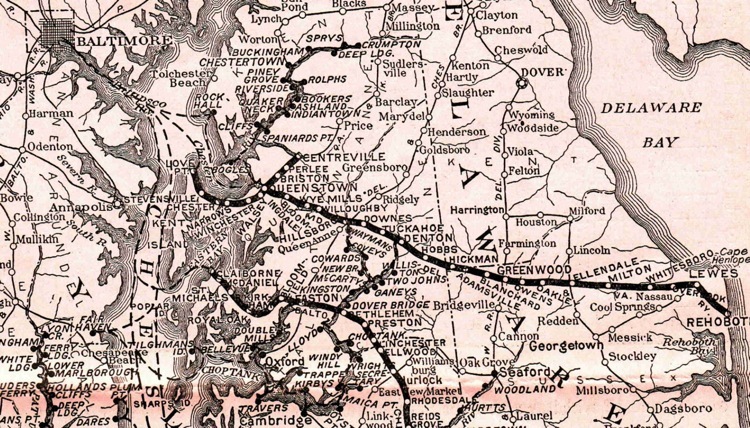 The rails led from Lewes, Delaware to Queenstowne, Maryland where passengers were picked up by steamship and transported out the Chester River and across the Bay. 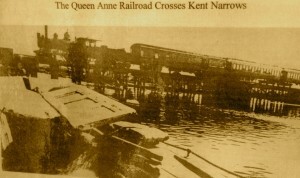 In 1902, plans were put in place to extend the rails thirteen miles over Kent Narrows and north across Kent Island to a ferry dock at Love Point. The first train crossed the trestle in 1907. After a couple of busy decades the Queen Anne’s Railroad fell on hard times. By 1931 passenger service was discontinued and the trestle was abandoned. It was eventually torn down in order to allow boats to navigate through the Narrows. Although this bridge was razed, there are several still standing from the old Queen Anne Line. One of my favorite places to fish in the spring is the railroad bridge over Tuckahoe Creek. The trestle over the Choptank River near Denton is also a very good fishing spot. I think there’s something about wooden bridges that fish like. Saturday, after I made my discovery at Kent Island Day and our street reopened, I decided to go fishing again. Motoring over the pilings, I spent a little time with my StructureScan investigating what was left of the old railroad bridge. I had previously thought the pilings were only on the east side of the channel, but after a closer look it was apparent they stretch all the way across the Narrows. 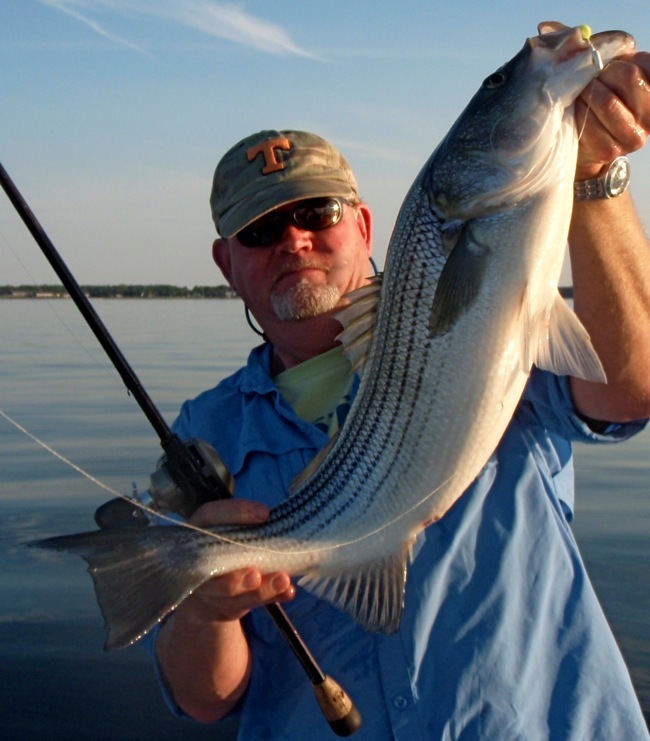 In some places they don’t come up far off the bottom, just enough to provide a comfortable hiding place for stripers. As usual, the Narrows was crowded with weekend boaters, but I couldn’t resist throwing a jig. Sure enough, the fish were there. I couldn’t stay with them long because of the traffic, so I idled off though the no-wake zone in search of action in quieter waters. 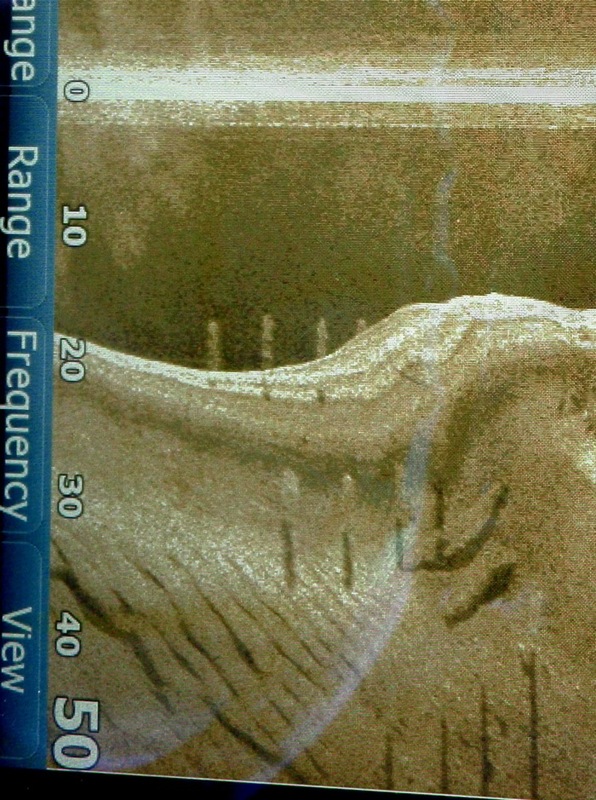 As I looked at what was left of the bridge disappearing on my sonar screen, I wondered what it might have been like to ride an old steam locomotive across the Narrows. I also thought about the people on the train who looked down through the smoke and the cinders and wondered about fish in the water they were passing over. I can only imagine what the fishing must have been like back then. It’s been a good weekend. 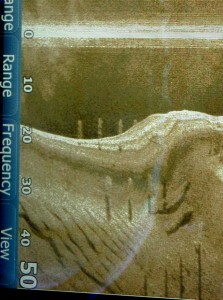 I got in a couple of hours Friday evening and found big fish breaking on the surface near the edge of a deep channel. I landed my biggest top-water striper of the year, a thirty-six incher on a pearl Stillwater SmackIt. Unfortunately, I didn’t get a good picture. I also had five more fish over thirty inches that evening. The water is very clear south of Kent Island, a welcome change from the bad water above the Bay Bridge. I found lots of bait and plenty of feeding fish. After my early morning stop at the trestle, I found more big fish including three more that went over thirty inches long. Saturday evening I fished with my new Kent Island neighbor, Alberto. Alberto and I have been friends for a while, and it’s nice that he’s moved close by. He brought his kids over Saturday morning and spent a few minutes sitting on our front porch before he took them to the festival. After looking around a while, we settled on working shoreline structure with top-water lures. 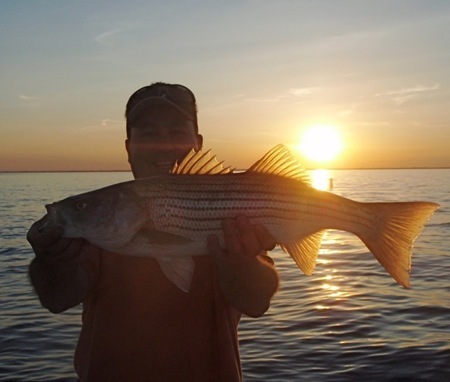 After a few casts he landed his first ever top-water striper, a strong healthy fish that went almost 28 inches. I slept-in Sunday morning but got out with my semi-regular fishing partner Rich in the afternoon. Our schedules haven’t meshed lately, so we haven’t fished together very much. It was good to get on the boat with Rich again. It took a lot of looking, but we finally found fish in one of the rivers and finished the evening strong with nice stripers on both jigs and top-water lures. I think Rich got his best fish of the night on his last cast, well after sunset. Water temperatures are climbing into the mid-60s now, so top-water will be my method of choice for the next few weeks. With air temperatures relatively cool, there are still some very big fish to be caught. Birds and breakers are a bonus, but that’s not what it’s about right now. 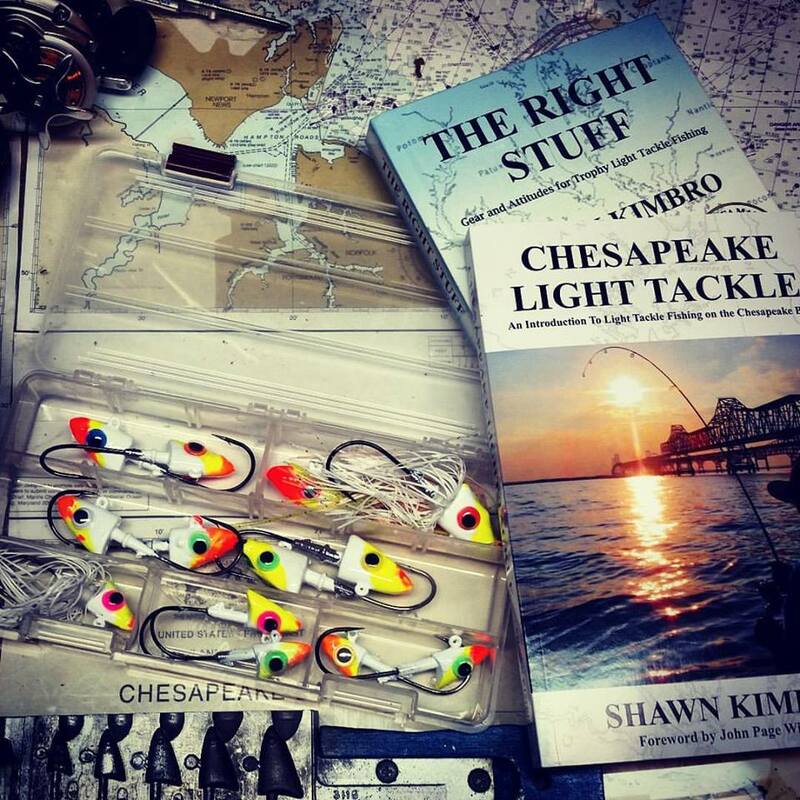 I’m looking for big bait schools and jigging suspended fish over deep water ledges or throwing top-water lures to shoreline structure. So the only thing left to reveal in this fishing report is the location of the Queen Anne’s railroad trestle over Kent Narrows. Well, I think I’ll keep that secret to myself for awhile. I suspect there are a lot of fishermen who already know exactly where it is. If you don’t, there are plenty of clues above the water in addition to the ones you can see on your fish finder, just go slowly and look carefully. If you find it, toss a jig in honor of times past when iron horses rumbled across steel rails and passengers on the Queen Anne line looked down through the smoke and the cinders and wondered about rockfish beneath that trestle. They’re still there. I love history and finding out what “that old building” and “those old pilings” were from. Very nice read and thanks for the report.